I am a postdoctoral fellow at the Center for Particle Cosmology, University of Pennsylvania, Philadelphia, USA. Previously, I was a senior research fellow at the Institute of Cosmology and Gravitation, Portsmouth University, UK. Before that, I was a visiting fellow at the Perimeter Institute for Theoretical Physics, Waterloo, Ontario, Canada and a Ph.D. candidate at the Department of Applied Mathematics and Theoretical Physics, University of Cambridge, UK. I am a theoretical physicist who is interested in understanding the nature of our universe using the interface of cosmology, gravitation, and astrophysics. I spend a lot of my time thinking about the biggest mysteries in modern physics, such as what is causing the expansion of the universe to accelerate, and why there is more matter than anti-matter. This has led me to study physics on many scales, from stars and galaxies, to black holes and gravitational waves, to the early universe. My research focuses on the interplay of astrophysics, cosmology, and gravitation. I spend a lot of time trying to devise methods for testing theories of fundamental physics in frontier regimes such as cosmology and gravitational waves using objects such as black holes and neutron stars. It was over 100 years ago that Einstein predicted the existence of gravitational waves, ripples in space-time that move at the speed of light. These were only observed for the first time in 2015 when the gravitational radiation from two merging black holes were observed, and only in 2017 did we first detect gravitational waves from merging neutron stars. This has allowed us to look at the sky in gravitational waves for the first time, opening a new window to the universe. In the case of the neutron star merger, we were even able to see the light that was produced in the collision. This observation heralded the era of multi-messenger astronomy, where we can look at astrophysical events in both the optical and gravitational wave spectrum. One important consequence of this is that we now know that light and gravitational waves move at the same speed. This allowed me to rule out several potential gravity theories at once. In the future we will have thousands of detections a year, which will allow us to use them for precision science, and tests of fundamental physics. This inspires me to study gravitational physics and make new predictions of what could be out there. We were all taught in school that the universe is expanding but in the last decade or so there have been several observations that the expansion is actually accelerating. The universe is expanding faster and faster. "So what?" you might say, if it's expanding then what does it matter whether it’s accelerating or not? We all know that gravity is an attractive force that it pulls things together and it is the force that dominates the behavior of the universe. Even if the universe is expanding we would expect gravity to pull everything together, not push it apart and so whatever is causing this expansion, it is very unlikely to be gravity. This mysterious mechanism driving the acceleration of the universe has come to be known as dark energy. So what could possibly be causing this strange behavior? One possibility is that there is some strange new type of matter that repels itself under gravity, but another possibility is that gravity itself behaves differently on cosmological scales to how it works in the solar system. It is this possibility that I am interested in. I have thought about several possible explanations for this, including introducing new gravitational interactions, giving a mass to the graviton, and even theories where we live on a slice of a higher-dimensional space-time. Over the next decade, several satellites and telescopes will catalog data from over a billion galaxies, which will allow us to distinguish between different possibilities with high precision. Matter and anti-matter can annihilate each other and vanish from the universe. The fact that we are all here means that there must have been more matter than anti-matter in the early universe. Where did this extra matter come from? Our best model of particle physics-the standard model-predicts equal amounts of mater and anti-matter, so this is strong evidence that there is physics beyond this. I have developed several models where the symmetry between matter and anti-matter could be broken in the early universe, either because the standard model could interact with dark matter, there could be a preferred frame of reference in the universe, or there could be new gravitational interactions. Jonathan J. Heckman, Craig Lawrie, Ling Lin, Jeremy Sakstein & Gianluca Zoccarato, Pixelated Dark Energy arXiv: 1901.10489. Hector O. Silva, Caio F.B. Macedo, Thomas P. Sotiriou, Leonardo Gualtieri, Jeremy Sakstein & Emanuele Berti, On the stability of scalarized black hole solutions in scalar-Gauss-Bonnet gravity arXiv: 1812.05590. Jeremy Sakstein & Mark Trodden, Oscillons in Higher-Derivative Effective Field Theories, arXiv: 1809.07724. Jeremy Sakstein, Astrophysical tests of screened modified gravity , Int.J.Mod.Phys. D27 (2018) no.15, 1848008, URL. Justin Khoury, Jeremy Sakstein & Adam R. Solomon, Superfluids and the Cosmological Constant Problem, JCAP 1808 (2018) no.08, 024, arXiv: 1805.05937. Hector O. Silva, Jeremy Sakstein, Leonardo Gualtieri, Thomas P. Sotiriou & Emanuele Berti, Spontaneous scalarization of black holes and compact stars from a Gauss-Bonnet coupling, Phys.Rev.Lett. 120 (2018) no.13, 131104, arXiv: 1711.02080. Jeremy Sakstein & Bhuvnesh Jain, Implications of the Neutron Star Merger GW170817 for Cosmological Scalar-Tensor Theories, Phys.Rev.Lett. 119 (2017) no.25, 251303, arXiv: 1710.05893. Jeremy Sakstein, Tests of Gravity with Future Space-Based Experiments, Phys.Rev. D97 (2018) no.6, 064028, arXiv: 1710.03156. Clare Burrage & Jeremy Sakstein, Tests of Chameleon Gravity, Living Rev.Rel. 21 (2018) no.1, 1, arXiv: 1709.09071. Ruifeng Dong, Jeremy Sakstein & Dejan Stojkovic, Quasi-normal modes of black holes in scalar-tensor theories with non-minimal derivative couplings, Phys.Rev. D96 (2017) no.6, 064048, arXiv: 1704.02425. Jeremy Sakstein & Adam R. Solomon, Baryogenesis in Lorentz-violating gravity theories, Phys.Lett. B773 (2017) 186-190, arXiv: 1705.10695. Jeremy Sakstein, Bhuvnesh Jain, Jeremy Heyl, & Lam Hui, Tests of Gravity Theories Using Supermassive Black Holes, Astrophys.J. 844 (2017) no.1, L14, arXiv: 1704.02425. Jeremy Sakstein & Mark Trodden, Baryogenesis via Dark Matter-Induced Symmetry Breaking in the Early Universe, Phys.Lett. B774 (2017) 183-188, arXiv: 1703.10103. Jeremy Sakstein, Eugeny Babichev, Kazuya Koyama, David Langlois & Ryo Saito, Towards Strong Field Tests of Beyond Horndeski Gravity Theories, Phys.Rev. D95 (2017) no.6, 064013, arXiv: 1612.04263. Jeremy Sakstein, Michael Kenna-Allison & Kazuya Koyama, Stellar Pulsations in Beyond Horndeski Gravity Theories, JCAP 1703 (2017) no.03, 007, arXiv: 1611.01062. Clare Burrage & Jeremy Sakstein, A Compendium of Chameleon Constraints, JCAP 1611 (2016) no.11, 045, arXiv: 1609.01192. Eugeny Babichev, Kazuya Koyama, David Langlois, Ryo Saito & Jeremy Sakstein, Relativistic Stars in Beyond Horndeski Theories, Class.Quant.Grav. 33 (2016) no.23, 235014, arXiv: 1606.06627. Jeremy Sakstein, Harry Wilcox, David Bacon, Kazuya Koyama & Robert C. Nichol, Testing Gravity Using Galaxy Clusters: New Constraints on Beyond Horndeski Theories , JCAP 1607 (2016) no.07, 019, arXiv: 1603.06368. Jeremy Sakstein & Kazuya Koyama, Testing the Vainshtein Mechanism using Stars and Galaxies, Int.J.Mod.Phys. D24 (2015) 12, 1544021. Jeremy Sakstein, Testing Gravity Using Dwarf Stars, Phys.Rev. D92 (2015) 12, 124045, arXiv: 1511.01685. Jeremy Sakstein, Hydrogen Burning in Low Mass Stars Constrains Alternative Gravity Theories, Phys.Rev.Lett. 115 (2015) 201101, 051, arXiv: 1510.05964. Jeremy Sakstein & Sarunas Verner, Disformal Gravity Theories: A Jordan Frame Analysis, Phys.Rev. D92 (2015) 12, 123005, arXiv: 1509.05679. Hiu Yan Ip, Jeremy Sakstein & Fabian Schmidt, Solar System Constraints on Disformal Gravity Theories, JCAP 1510 (2015) 10, 051, arXiv: 1507.00568. Kazuya Koyama & Jeremy Sakstein, Astrophysical Probes of the Vainshtein Mechanism: Stars and Galaxies, Phys.Rev. D91 (2015) 12, 124066, arXiv: 1502.06872. Jeremy Sakstein, Astrophysical Tests of Modified Gravity, Ph. D. thesis, arXiv: 1502.04503. Jeremy Sakstein, Towards Viable Cosmological Models of Disformal Theories of Gravity, Phys.Rev. D91 (2015), arXiv: 1409.7296. Jeremy Sakstein, Disformal Theories of Gravity: From the Solar System to Cosmology, JCAP 1412 (2014), arXiv: 1409.1734. Jeremy Sakstein, Bhuvnesh Jain, & Vinu Vikram, Detecting modified gravity in the stars, Int.J.Mod.Phys. D23 (2014), arXiv: 1409.3708. Vinu Vikram, Jeremy Sakstein, Charles Davis, & Andrew Neil, Astrophysical Tests of Modified Gravity: Stellar and Gaseous Rotation Curves in Dwarf Galaxies, Phys.Rev. D97 (2018) 104055, arXiv: 1407.6044. Jeremy Sakstein, Stellar Oscillations in Modified Gravity, Phys.Rev. D88 (2013), arXiv: 1309.0495. Philippe Brax, Anne-Christine Davis, & Jeremy Sakstein, Dynamics of Supersymmetric Chameleons, JCAP 1310 (2013), arXiv: 1302.3080. Philippe Brax, Anne-Christine Davis, & Jeremy Sakstein, Pulsar Constraints on Screened Modified Gravity, Class.Quant.Grav. 31 (2014), arXiv: 1301.5587. Philippe Brax, Anne-Christine Davis, & Jeremy Sakstein, SUPER-Screening, Phys.Lett. B719 (2013), arXiv: 1212.4392. Bhuvnesh Jain, Vinu Vikram, & Jeremy Sakstein, Astrophysical Tests of Modified Gravity: Constraints from Distance Indicators in the Nearby Universe, Astrophys.J. 779 (2013), arXiv: 1204.6044. Anne-Christine Davis, Eugene A. Lim, Jeremy Sakstein, & Douglas Shaw, Modified Gravity Makes Galaxies Brighter, Phys.Rev. D85 (2012), arXiv: 1102.5278. Jeremy Sakstein, Antonio Pipino, Julien E.G. Devriendt, & Roberto Maiolino, The Origin and Evolution of the Mass-Metallicity Relation using GalICS, Mon.Not.Roy.Astron.Soc. 410 (2011), arXiv:1008.4158. A six hour lecture course aimed at postdocs and graduate students at the Institue of Cosmology and Gravitation, University of Portsmouth, UK. The course is an introduction to non-relativistic gravity with an aim towards testing alternative theories of gravity. The topics covered are: Newtonian and post-Newtonian general relativity, screening mechanisms, and non-relativistic stars. The notes are available here. A talk given at the University of Pennsylvania, PA Astronomy Journal Club on 22/09/2018. The talk gives a brief introduction to dynamical dark energy and introduces a new string theory model where the Universe is made of pixels. The model successfully predicts inflation, reheating, and dynamical dark energy, and has several attractive features, for example, there is no cosmological constant problem, and the the recent swampland conjectures do not apply. The talk is aimed at physicists unfamiliar with string theory and dark energy theory modeling. An invited talk given at KICP University of Chicago, IL on 11/09/2018 and Columbia University, NY on 11/02/2019. 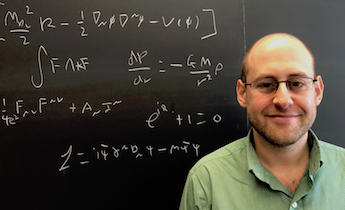 The talk reviews the cosmological constant problem, and my work towards fining a potential resolution whereby the universe would be filled with a superfluid that cancels out the effects of an arbitrarily large cosmological constant. Two invited lectures given at the workshop Parameterized Tests of General Relativity held at Johns Hopkins University from 29 October-07 Novembr 2018. The aim of these lectures are to bridge the gap between cosmologists, theorists, and strong gravity researchers, and to identify possible areas of overlap to target for future collaborative projects. Basics of cosmology, screening mechanisms (chameleon, symmetron, and Vainshtein), galileons, Horndeski theories and its extensions, Vainshtein breaking and neutron stars, cosmology after GW170817. Effective field theory, massive gravity, the cosmological constant problem, phase transitions and the cosmological constant, vacuum energy sequestering, superfluid degravitation, spontaneous scalarization of black holes, new ideas and targets for synergies. An invited talk given at the workshop Dark Interactions: Perspectives from Theory and Experiment held at Brookhaven National Laboratory from 02-05 October 2018. The talk discusses my work on testing gravity theories that could drive the cosmic acceleration using gravitational waves and multi-messenger astrophysics. In particular, how the simultaneous measurement of light and gravitational waves from the neutron star merger constrains dark energy theories. An invited talk given at KIPAC Stanford University, CA on 01/22/2018 and UC Irvine, CA on 01/23/2017. The talk discusses my work on testing alternative gravity theories by looking for offset supermassive black holes in galaxies falling into clusters. It then discusses the implications that the observation of gravitational waves and an optical counterpart from the neutron star merger GW170817 has for cosmological gravity theories. An invited talk given at the workshop Dark Energy in the Laboratory held at the Lorentz center, Netherlands from 13-17 November 2017. The talk discusses the parameter space of chameleon models in the context of cosmology and current constraints on all scales. The current state of the field is summarized and future prospects are discussed. An invited talk given at the workshop Probing the Dark Sector and General Relativity at all Scales held at CERN, Geneva from 14-25 August 2017. The talk reviews several different astrophysical tests of chameleon and galileon gravity theories, and relates the constraints to laboratory, cosmological, and strong field tests. A talk given at the conference PASCOS 2017 at Instituto de Fisica Teorica, Madrid on 20/06/2017. The talk discusses a new method for testing galileon gravity theories by looking for offset supermassive black holes in galaxies falling into clusters, and presents new constraints on the model parameters. An invited talk given at the Institute of Cosmology and Gravitation, University of Portsmouth on 04/14/2017. The talk describes two new mechanisms that could produce the asymmetry between matter and antimatter in the early universe. An invited colloquium talk given at the University of Mississippi on 11/01/2016. The talk reviews dark energy and modified gravity before presenting my work on testing beyond Horndeski gravity using dwarf stars and neutron stars. The talk is aimed a broad audience from non-cosmological areas of physics. An invited talk given at the workshop Unifying Tests of General Relativity held at Caltech from 19-21 July 2016. The talk reviews my work on testing gravity using dwarf stars and neutron stars and how the constraints can be connected to cosmology. A talk given at the Department of Applied Mathematics and Theoretical Physics, University of Cambridge, UK on 05/09/2016. The talk reviews my work testing beyond Horndeski gravity theories using stars and galaxies. A talk given at the ICG-KASI Collaboration Workshop on 09/17/2015. The talk reviews my work testing chameleon and Vainshtein screened theories using stars and galaxies. A colloquium talk given at the physics department at the University of Sheffield on 03/04/2015. The talk reviews my work over the last few years looking for probing chameleon and galileon gravity in using stars and galaxies. Talk given at the University of Helsinki on 12/03/2014. The talk describes my work on disformal theories of gravity. The first half discusses the Newtonian behaviour in the solar system and shows how the theory can be screened in the solar system depending on the cosmology. The second half classifies the possible cosmological solutions using dynamical systems techniques. An invited talk given at the workshop Non-linear Structure in the Modified Universe held in at the Lorentz Centre in Leiden from 14-18 July 2014. The talk reviews the current status of various screening mechanisms, identifies future directions in their study and discusses the future prospects for probing them on small scales. An invited talk given at the workshop Novel Probes of Dark Energy and Modified Gravity at the University of Pennsylvania from 26-27 April 2014. The talk gives a general introduction to chameleon-like theories giving an overview of the current constraints and recent developments in the field. xAct is an add-on package for Mathematica that performs tensor algebra. I have written a short tutorial that is aimed at researchers working in modified gravity and cosmology. The topics covered are: tensor manipulations (xTensor), equations of motion (xPert), coordinate systems (xCoba), cosmological perturbation theory (xPert), and relativistic stars. xAct can be downloaded here. Instructions for using xTras (including the packages that need to be downloaded) can be found here. The extra package xPand is also required and can be downloaded here. My tutorial is available here. I have also written some example problems that can be downladed here. Solutions are available upon request.